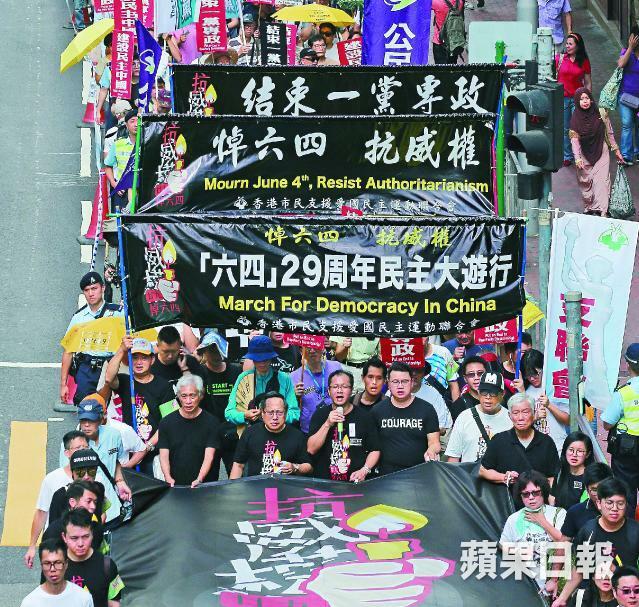 Hundreds marched through Hong Kong on Sunday ahead of the 29th anniversary of China’s crackdown on democracy protesters in Beijing’s Tiananmen Square. 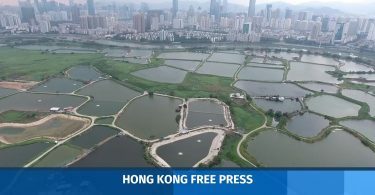 Semi-autonomous Hong Kong is the only place on Chinese soil where the anniversary is openly marked with a famous vigil in Victoria Park on June 4 each year. The march is an annual precursor to the main event. 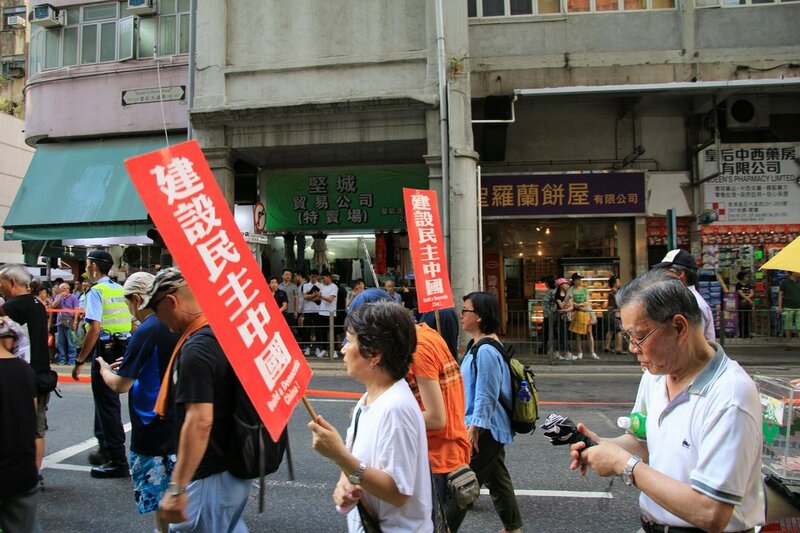 Organised by a group of veteran democracy activists, protesters demanded justice for the victims of the crackdown and also urged the Chinese government to release Liu Xia, widow of Nobel Peace Prize laureate Liu Xiaobo, who continues to be under house arrest since her husband’s death in custody last year. Protesters shouted “Accountability for the massacre! 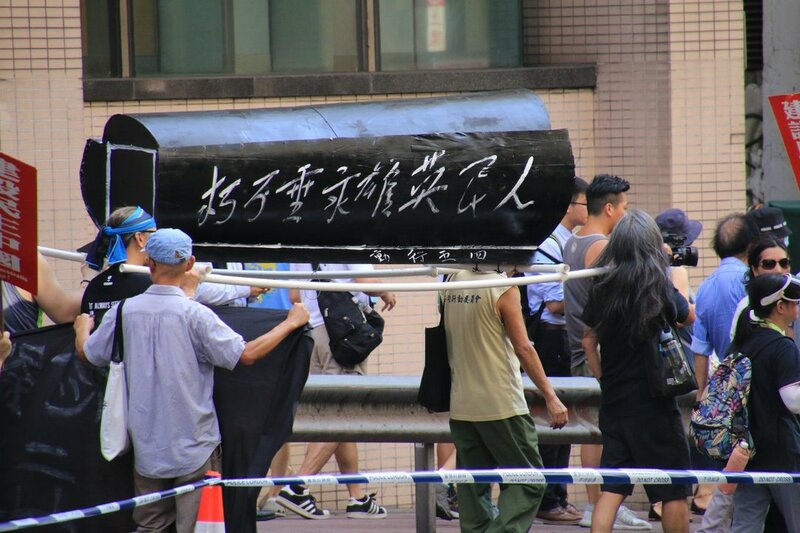 End one-party dictatorship,” and held banners reading: “Mourn June 4, Resist Authoritarianism” as they walked from the business district of Wan Chai to Beijing’s liaison office in the city. 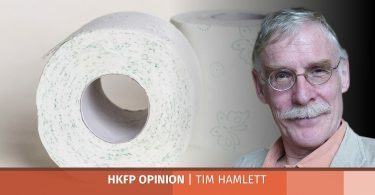 The disqualification of pro-democracy lawmakers from parliament and the banning of some activists from standing for office has heightened concern that Hong Kong’s cherished freedoms are being steadily eroded by Beijing. 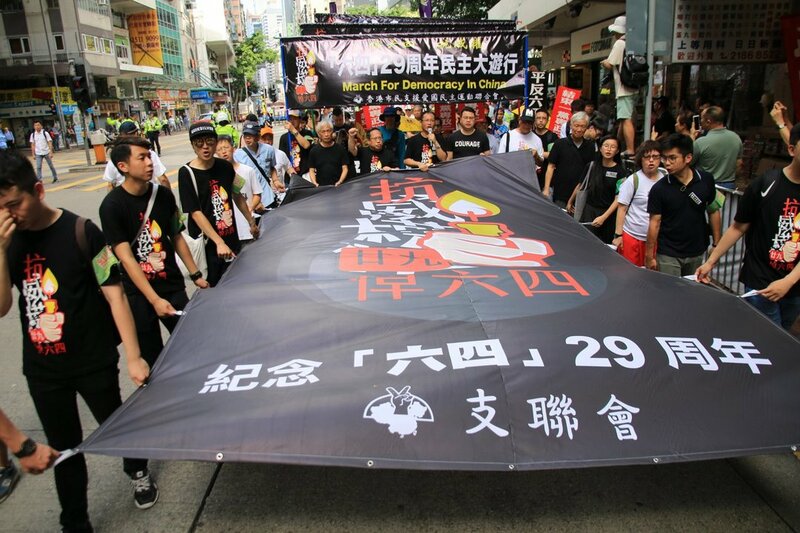 Protesters hold a banner which reads “March For Democracy in China” as they take part in a march in Hong Kong on May 27, 2018 to commemorate the June 4, 1989 Tiananmen Square crackdown in Beijing. Photo: Anthony Wallace/AFP. 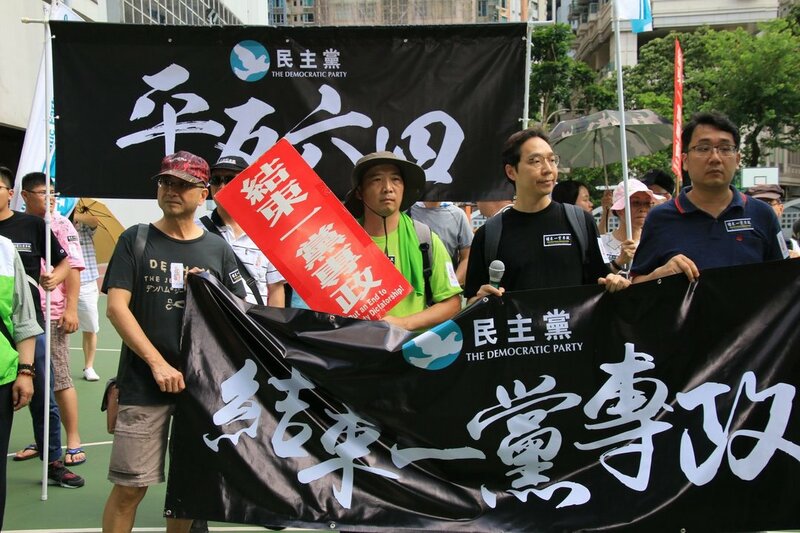 Pro-Beijing figures have said recently that calling for an end to one-party dictatorship is “illegal” and that anyone who does so could run the risk of being disqualified from running for election. “This is our freedom, our right, and also our belief. We do not hesitate to continue saying our slogan. 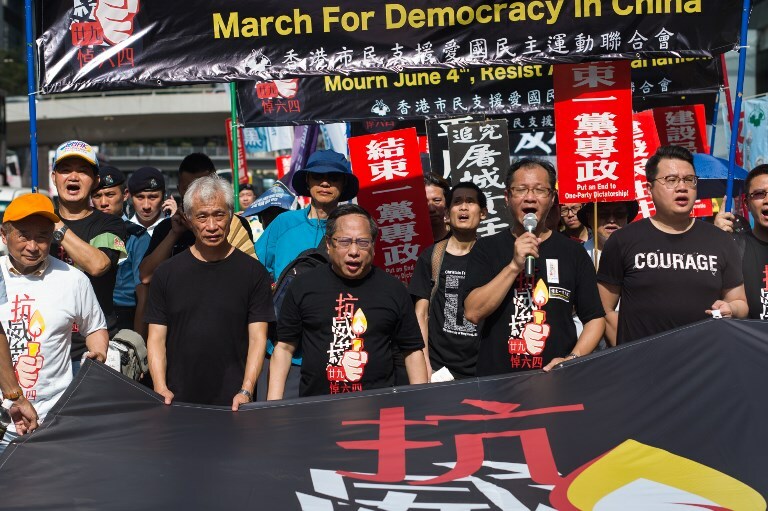 We believe that only by ending the one-party dictatorship can we build democratic China,” said Albert Ho, chairman of Hong Kong Alliance in Support of Patriotic Democratic Movements of China, which organised the march. Ho said that around 1,100 people attended the protest. Residents said they were marching to ensure the bloody crackdown was not forgotten. 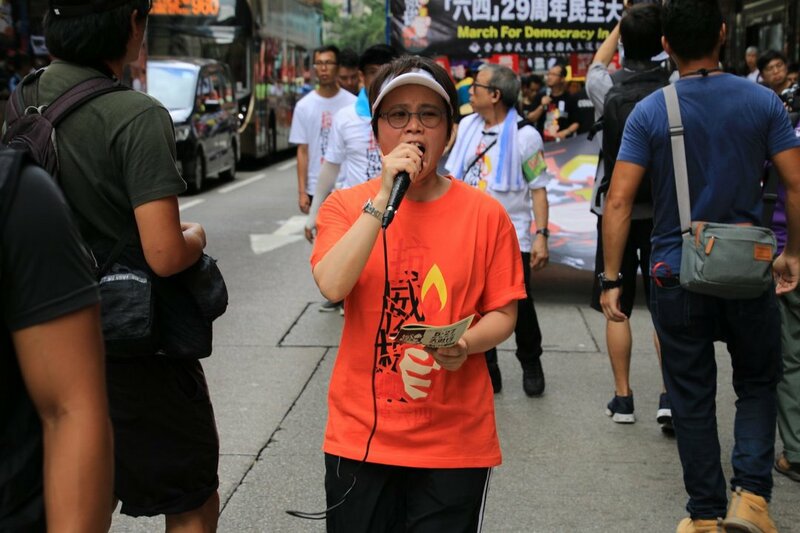 “If nobody talks about it, the next generation will never know about this history,” said a woman who gave her name as Mrs Ho, and attended the protest with her son. “China’s Communist Party will not listen to citizens and people’s voices. 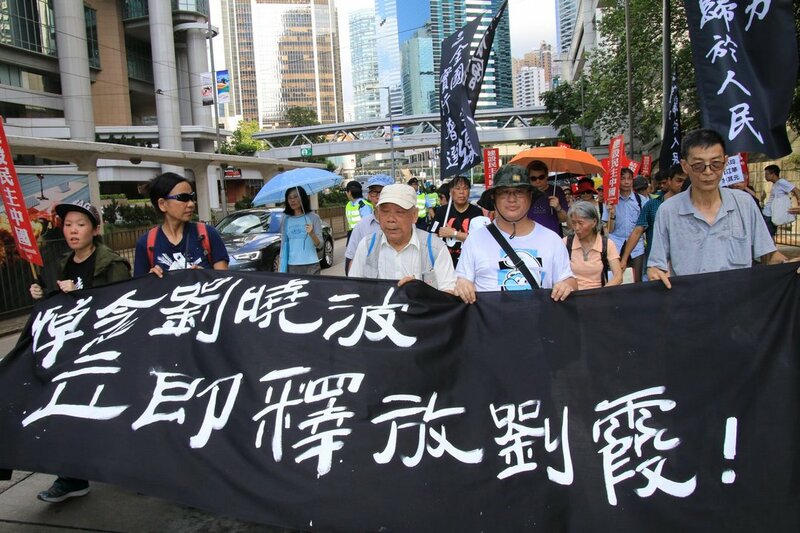 Although I was not born at that time, I heard my parents talk about it and I knew Hong Kong people went on the streets… to fight for their democracy and rights,” added another protester who gave his name as Kelvin. 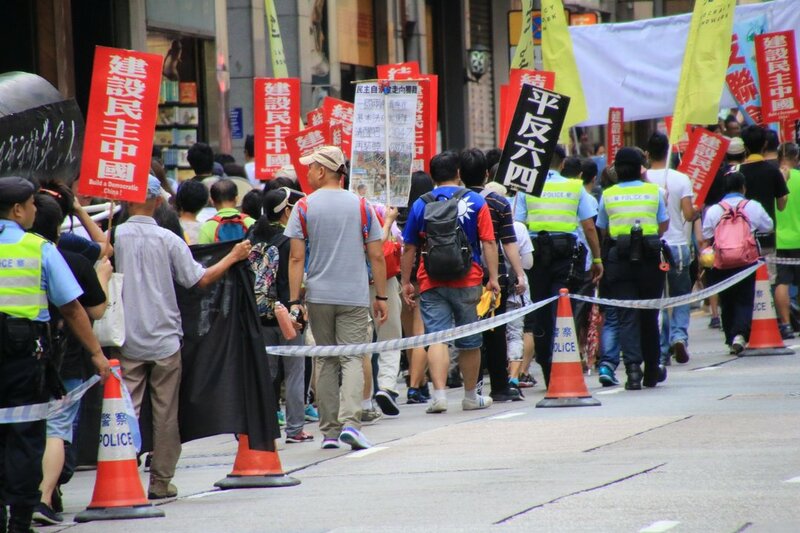 However, the turnout figures for the march and vigil have dropped in recent years as many young Hong Kongers are frustrated by the lack of progress on political reform in the city. 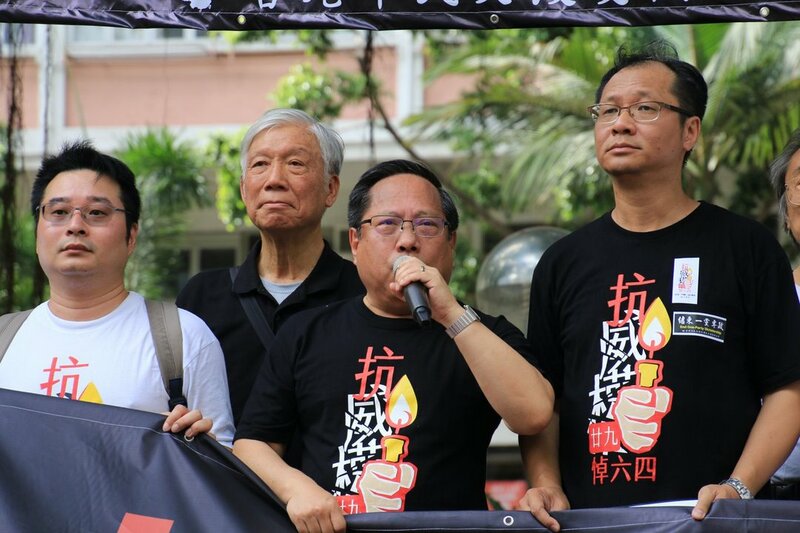 They disagree with the vigil’s main message of democratisation in China, saying the focus should be on Hong Kong, not the mainland. Student unions will not attend the longstanding vigil in Victoria Park this year and have boycotted it for the past three years. Hundreds — by some estimates more than a thousand — died after the Communist Party sent tanks to crush demonstrations in the square in the heart of Beijing on June 4 1989, where student-led protesters had staged a peaceful seven-week sit-in to demand democratic reforms.